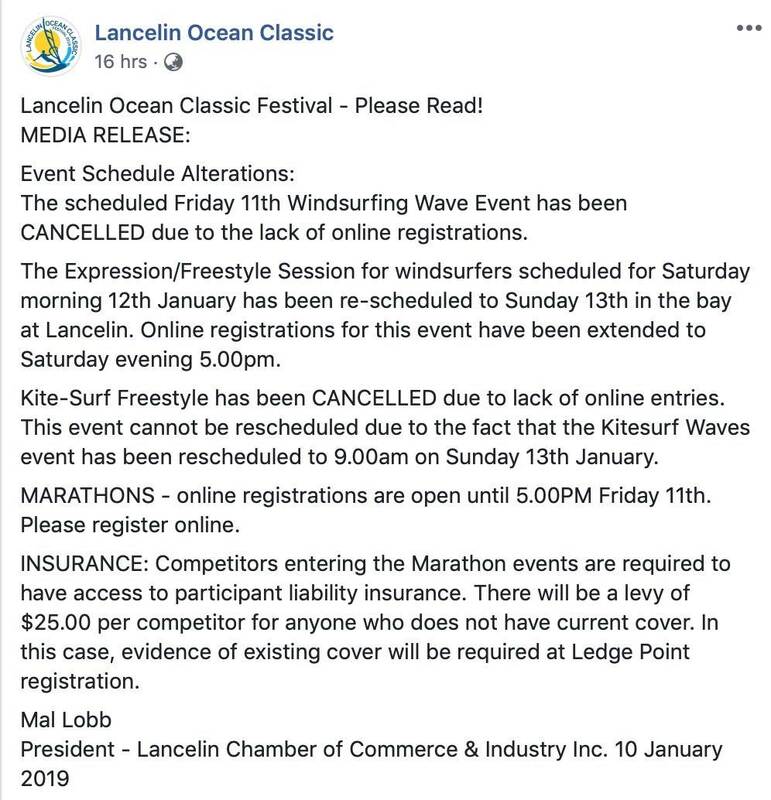 Lancelin Ocean Classic update in relation to Windsurfing Western Australia (WWA) and the Australian Windsurfing Association (AWA). In the previous three years, the Lancelin Ocean Classic has been sanctioned by WWA & AWA at the request of the events company responsible for organising the event. For this year's edition that request has not been made and therefore the process to sanction the event has not been carried out as required. WWA & AWA understand that the event organiser have arranged for insurance coverage for the event through their own provider. We will take this opportunity to reiterate that the Windsurfing Western Australia (WWA) and the Australian Windsurfing Association's insurance coverage is specifically extended to windsurfing recreationally and at sanctioned events. It is the duty of the event organiser to ensure adequate insurance coverage for the event where they take the role in organising and administering an event. If anyone has any further questions, please feel free to send us an email and we'll attempt to answer all of your queries. Below is what was posted on the Lancelin Ocean Classic Facebook site yesterday (Thursday) afternoon. Basically, the entry fee was increased by $25 for anyone who cannot provide proof of insurance coverage (which probably applies to a lot of international competitors). So far, they have cancelled the SUP event, windsurfing wave, and kite freestyle. Please re-read our post very carefully. ALL WWA members are impacted not just international sailors. I understood the post just fine the first time I read it. Many windsurfers in the US and Europe that I know have personal liability insurance that would probably be acceptable at the event. But an insurance policy is not something that's usually packed when traveling, hence the comment that this would affect international sailors. For WA windsurfers who happen to have a personal liability policy that covers the event , bringing the requested "evidence of existing cover" to the event would be a bit easier. 25 dollars for an average 40 minute race is 35 dollars plus per hour by my basic arithmetic skills. 200 competitors paying 25 dollars is a cool 5k potential profit. With all the volunteers for safety the race should be some of the safest ocean sailing around. 5 dollars seems appropriate,10 maximum. I take it insurance for the race is enforced by the Govt? If not,what is wrong with a visit to one of the Public Hospitals? so which way will you go Peter? Will you end up getting their insurance?